If you are missing teeth or are on the verge of tooth loss, don’t wait to seek a replacement. Left unattended to, tooth loss leads to jawbone degeneration and can actually cause even more missing teeth later on. Dental implants are a highly effective solution for replacing one, two, or a whole row of missing teeth in the top or bottom of the jaw. Dr. Klugman, your cosmetic dentist in Salinas, discusses dental implants in this week’s blog post. Q: What are dental implants? How do they work? A: Dental implants are small cylinders made of titanium. 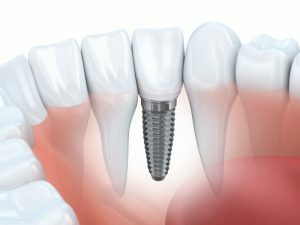 Each implant sort of resembles a miniature screw. They’re surgically implanted into the jawbone, where they integrate with the bone matter. Once fully stable, each dental implant works as a prosthetic root for the replacement crown that is secured on top. A: The procedure for dental implants can be divided into three phases. Implantation: The surgical procedure in which your implant dentist opens up the gums and places the implant inside, below the gumline. Recovery: The four to eight month period when the dental implant fuses with the jawbone (osseointegration). The length of the recovery for dental implants depends on the location of the tooth being replaced and the strength the jawbone. A temporary tooth replacement is worn during this time. Restoration: When a connecting abutment is placed on top of the dental implant and the prosthetic device (a crown, bridge, or denture) is attached. A: Implant-retained tooth replacement offers a wealth of benefits. With the stimulation provided by a dental implant, the jawbone stays healthy and whole. Non-implant retained dentures will need to be refitted or relined numerous times to keep up with the disintegrating jawbone. Not so with dental implants. Beyond these advantages of dental implants, they can also be the best financial investment in many cases. When cared for properly, dental implants can be expected to last the wearer’s lifetime. Q: How can I get started with dental implants? A: Get in touch with your implant dentist to determine your candidacy for dental implants. Patients who are in adequate oral and overall health are typically fit for the procedure. In successful candidates, dental implants have a 95 percent success rate. Contact Blanco Circle Dental Care to discuss your dental implants in Salinas.